Pimp That Snack! (or Pop Tarts: Go Big or Go Home) | Que Sera Sara? In an effort to complete Thirty Things #20, I have become rather adventurous in the kitchen. Bean has weathered it magnanimously – but then, when I get antsy of an evening and bustle about for a while, emerging shortly thereafter con pie who wouldn’t? *if you over work the pastry, it’ll be tough and totally strong enough for one-handed pie maneuvers. sans dishes. sans sitting. total bonus. It may have been more of a galette, but I’m not complaining. It was excellent with ice cream. But wait, you say, you said pop tarts. I did not sign on for pie. I demand a refund for the inappropriate confectionary content. Well, I say, hold your horses. We are getting to that part. Which (quite naturally) makes enough pastry for a real pie. With both top and bottom pieces. Not quite the same thing as handeld made-up pseudo-pie/wad o’ galette. 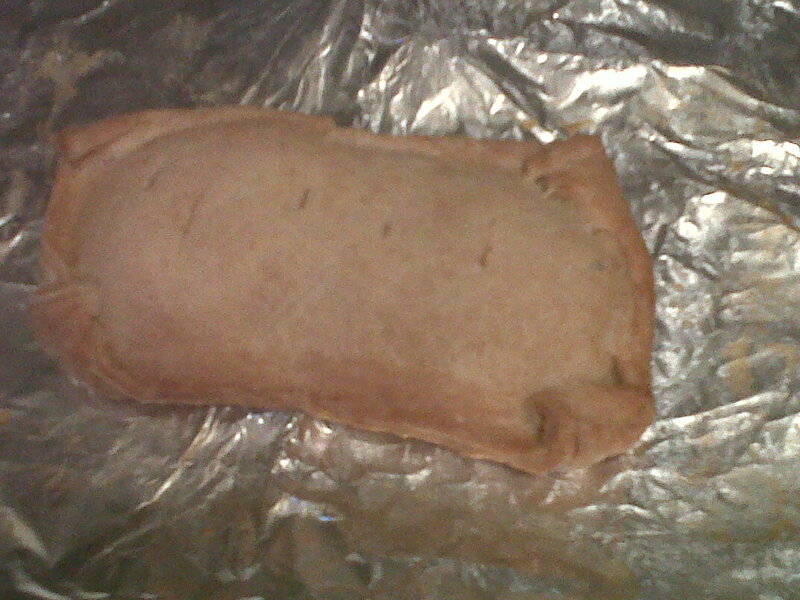 I was left with a quite a pastry lumpkin languishing in my fridge. Now I don’t know about your fridge, but mine has a habit of anthropomorphisizing everything I put in it. 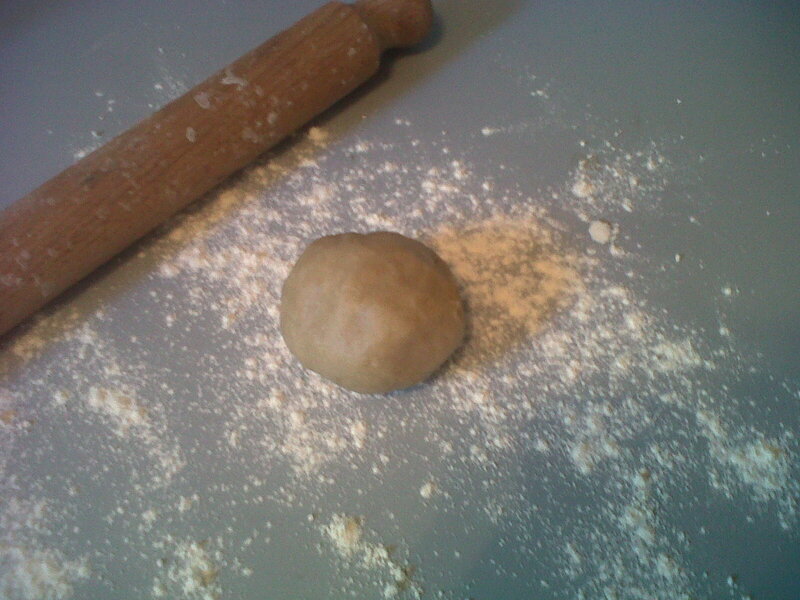 This ball of dough soon called out to me in dulcet tones. In a voice much like I imagine that of Lillian Gish, it pleaded to be put to some good purpose. It craved usefulness – which is admittedly odd for a dessert, even in my house, but who was I to argue? So anyway after I convinced myself (after several tries over several days) that raw pastry will never be as tasty as raw cookie dough, I decided to invent something wonderful. The large one was approximately the size of my forearm… for the point two seconds it remained in tact. As @bookshop_becky rightly pointed out, they would have been worthy of Pimp That Snack, formerly Pimp My Snack. 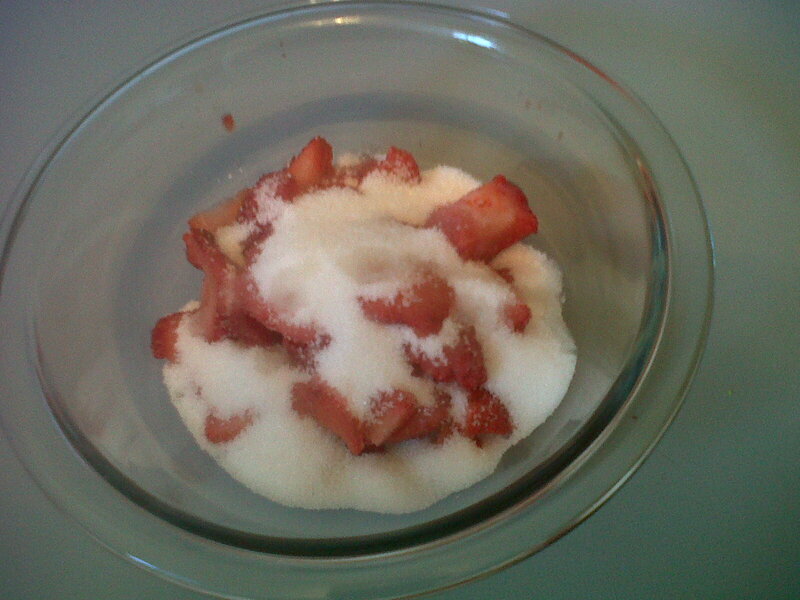 Combine the strawberries and granulated sugar in a small saucepan. This will magically become syrupy tasty sweet, extracting the juice from the berries in a process not dissimilar to decomposition. 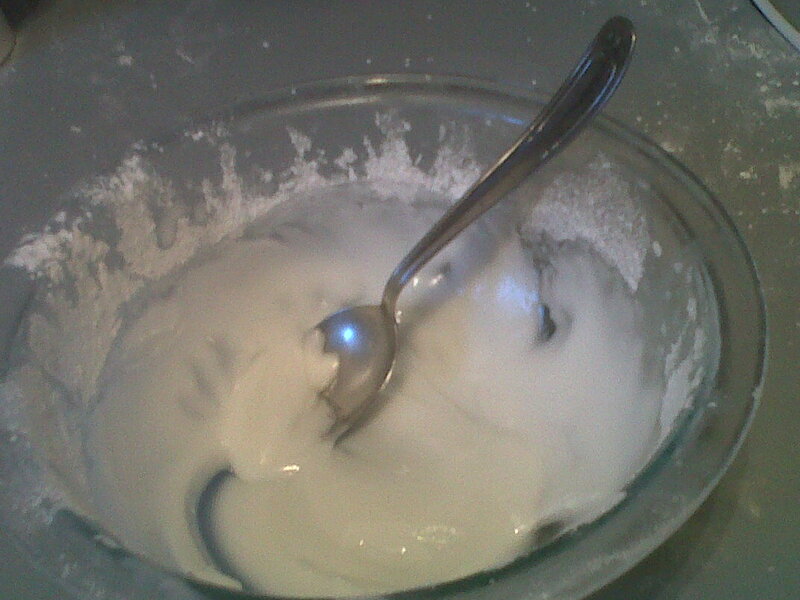 Add the eggs and milk to the mixture and gently work it together until you have a ball of pastry dough. Don’t work it too much at this stage – you want to keep it crumbly and short. 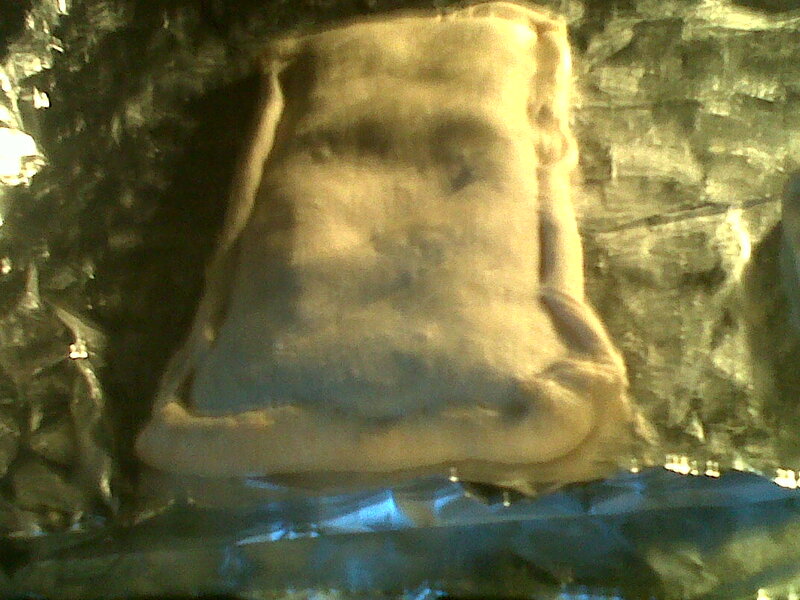 Sprinkle a little flour over the pastry, then wrap it in cling film and pop it into the fridge to rest for 1 hour. [Make sure it’s nice and cold so it’s easy to work with. While you wait, it may be a good time to make filling. Once your berry mixture has broken down to seriously lumpy syrup (some in tact berries are okay), add a splash of vanilla and put it on medium heat. You’re thickening this to an almost-jam. I added a bit of flour for thickener, but you don’t have to. Let it bubble a bit, but stir constantly so it doesn’t burn. When it’s thick but spreadable, remove from heat and let it cool down a bit while you pastrify. Roll the pastry out on a very floured surface as thinly as possible. Like tiny thin. Almost see-the-counter-through-it thin. Try to keep it roughly square so the cutting stages are easier. 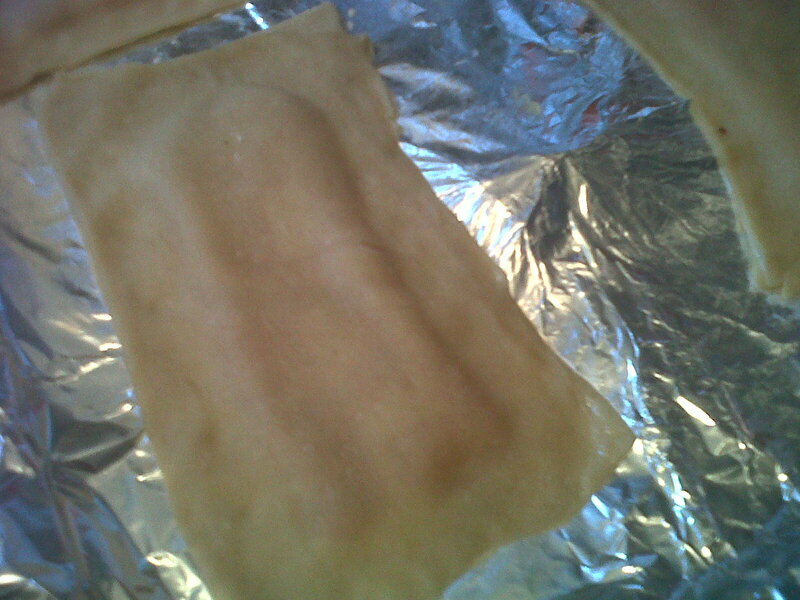 Cut the pastry into rectangles [or whatever shape you want your poptarts to be]. If you are eyeballing you rectangles and have no eye hand coordination like me, at least make sure you have pairs of roughly the same size and shape to match up together. Put the bottom pieces of pastry on the cookie sheet. 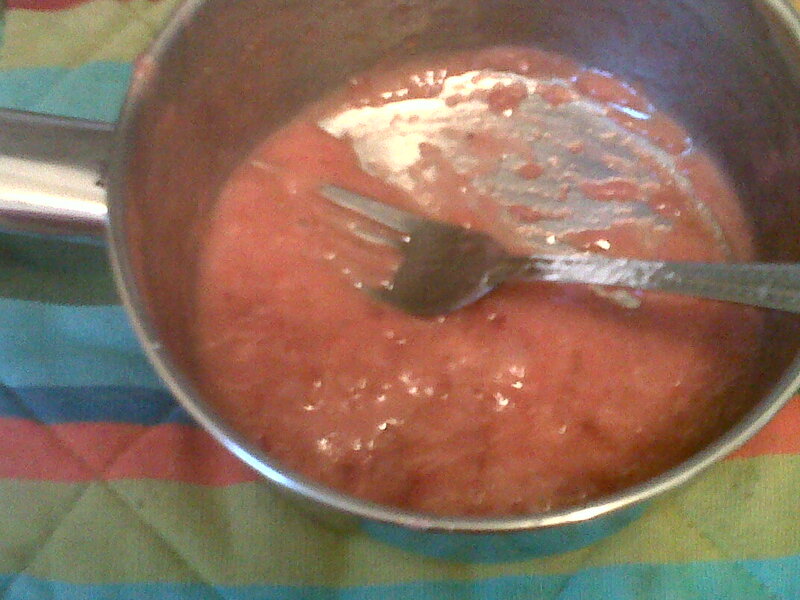 Put a tablespoon or two of jam spread around the centres, leaving a centimeter of edge clean. 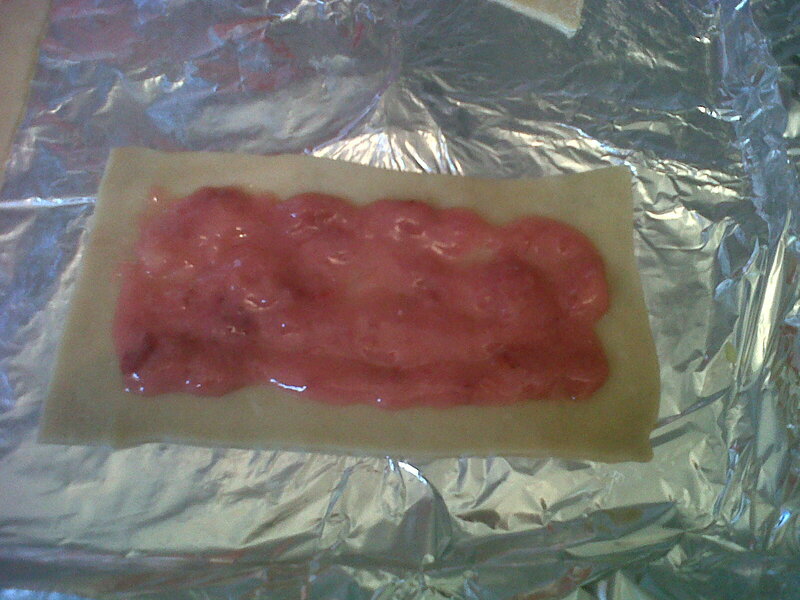 Paint the clean edges with milk (or egg) and place the top halves over your poptarts. Press the edges together to cement them. They will probably look like unappetising ravioli. Fold and roll the edges up together until there is a puffed edge snuggly sitting next to the filling pillow. Make sure there aren’t any gaps or holes or all your filling will gush out. Brush the tops with milk or egg and cut small slits or holes in the jam pillow to help it vent. 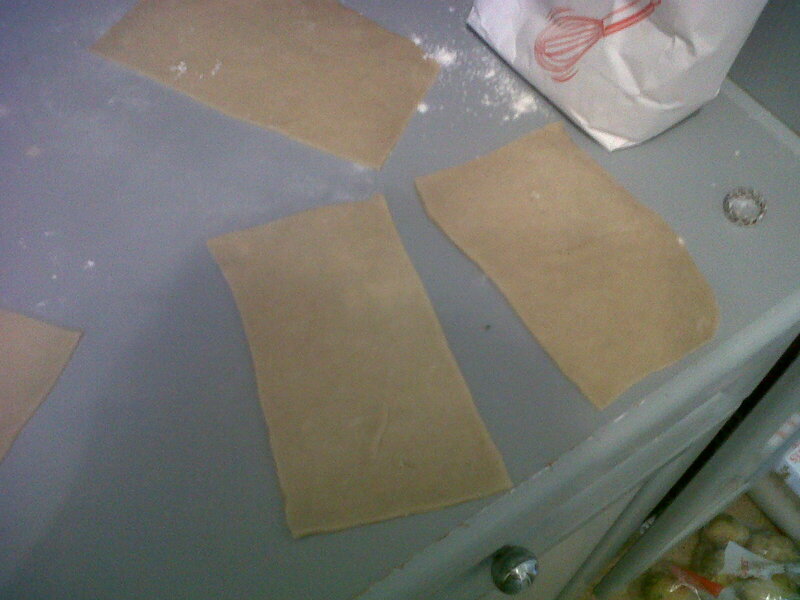 Cut only the top bit of pastry, leaving the bottom in tact. in the oven with you! 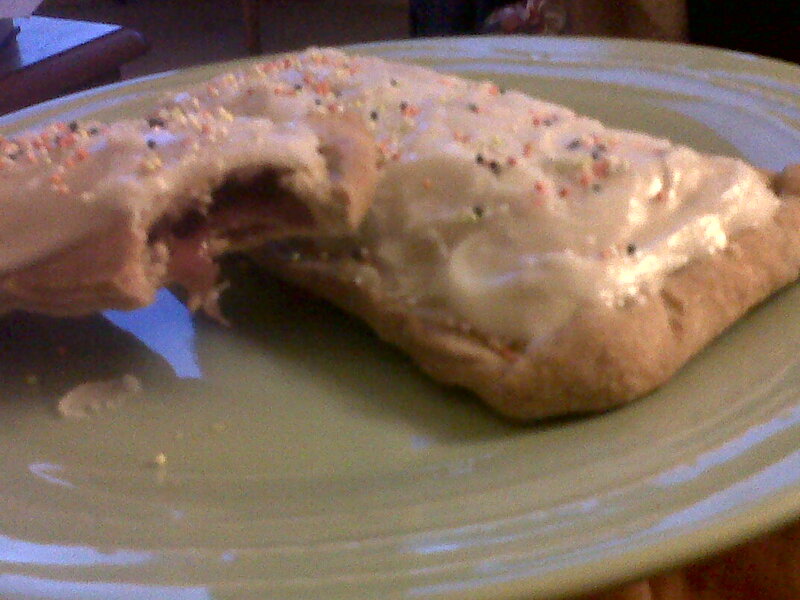 Bake your poptarts for around 15 minutes. Their cooking time will depend on their size, so keep an eye on them. The pastry should puff up a bit and be golden brown at the edges. 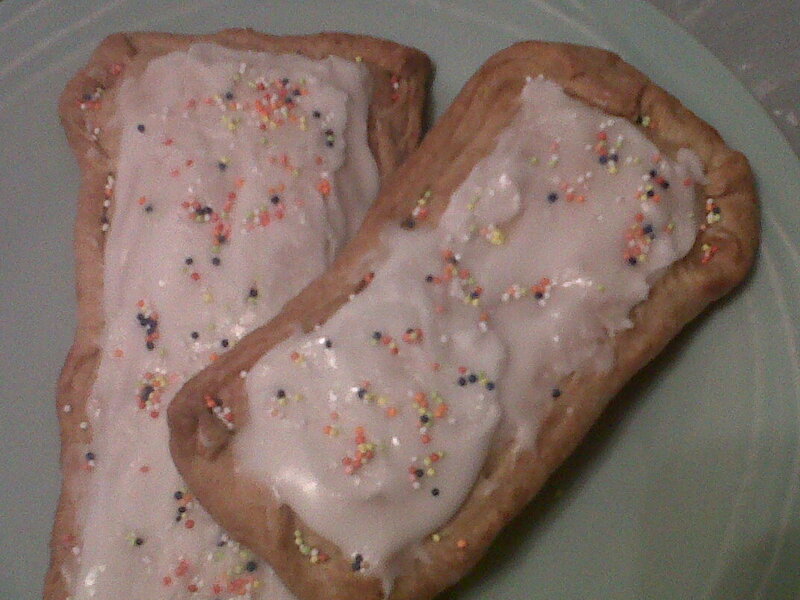 Once baked remote the tarts from the oven. Frost lightly, coat with sprinkles and eat. Though warning: if you fill yours with a generous dollop of jam be careful. They are steamy little suckers and do not play well with the roofs of mouths. Having tried the store-bought kind since, I can honestly say we improved every aspect of this handheld sweet treat. No chemical after taste. No burnt edges with unmelted middle. No sadly under-iced ones. Perfectly awesome in every way.